September soundShoppe was outstanding, with lots of “boys with toys.” There seemed to be a duo thing happening this month. From The Mercury Seven there was Ken Lee and Christopher Echols. Ken had an array of instruments including a Pigtronix Echolution analog delay pedal, Strymon Blue Sky Reverb, Tingsha Tibetan chimes and Tibetan singing bowls. Mainly though he played a Korg MS-20 analog monophonic synthesizer that is hard wired but also has a patch bay. Christopher was playing a Korg MS 2000 monosynth, hard wired but with a “Virtual Patch” mode in which the signal can be routed to various sections of the synth. Its versatility can be witnessed by the fact that both Einstuerzende Neubauten and Flock of Seagulls have used it. He also had some small percussion instruments. 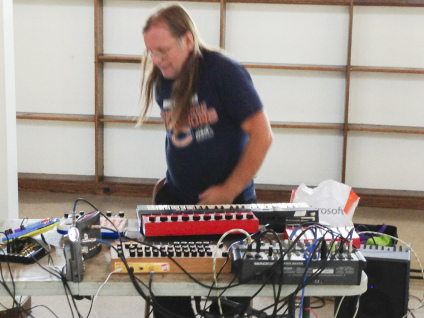 Another duo at soundShoppe was Don Lewis and Artzenkraft. Don has “Small Drone Orchestra” and Artzenkraft plays in the larger version of “Small Drone Orchestra”. Don brought his drum kit and trumpet. Artzenkraft played his ambient extended guitar (caressing the strings with a bow), an array of pedal effects and a tone generator. At one point, Jeff Boynton set up a microphone in front of Don and processed his antics. Jeff was mostly using circuit bent stuff. He brought a circuit bent Casio MT-240 (a favorite of benders due to its versatility), a bent King Kong keyboard (think it is a gamer’s keyboard), and Vtech’s Talk N Learn Numbers among other things. He had a surprising array of sound going on. The other duo happening was Tom Recchion and me, LAFMS cohorts since the mid Seventies and Extended Organ band mates. Tom brought a Power Book full of Recchionesque samples including sounds from the rides at Pacific Ocean Park, the defunct Venice 1960’s amusement pier. Tom also was using an iPad which had among other apps a version of the John Cage Prepared Piano. He was processing things through a Line 6 DL-4 delay pedal which lumps a bunch of vintage delay effects like Tube Echoplex, Space Echo, Deluxe Memory Man together in one stomp box. Tom had a brief case full of percussion toys but I think he forgot to play them. I am still working with my Boss SP 404 sampler and Korg Kaossilator through a Boss Vocalist access trying to figure them all out on the fly. Anyway, these folks are all really great improvisers who know when to listen and when to wail and the 2-1/2 hours flew by. We definitely made it into a few unexplored realms. Well, Forrest Gump’s mom was right… these things are like a box of chocolates and this one was “sweet”. Categorized: The Potts Report. Tagged: Artzenkraft, Christopher Echols, Don Lewis, Jeff Boynton, Joe Potts, Ken Lee, Tom Recchion.